The Center for Chemistry at the Space-Time Limit (CaSTL) is dedicated to interrogating molecules at their natural length and time scales, with the purpose to unravel the details of such dynamic events as electron transfer, configurational motions, and a chemical reaction. To make this possible, CaSTL is developing new research tools, both on the experimental as well as on the theoretical end. One such example is the integration of ultrafast spectroscopy and scanning tunneling microscopy, which will produce a brand new view of the dynamic molecular world. Below is a summary of the current major thrust areas. The aim of the thrust is the integration of ultrafast nonlinear optical (NLO) spectroscopy with scanning tunneling microscopy (STM) to reach the joint space-time resolution limit of relevance to chemistry. 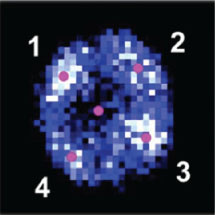 CaSTL researchers have successfully shown molecular fluorescence with Ångstrom resolution (left image). 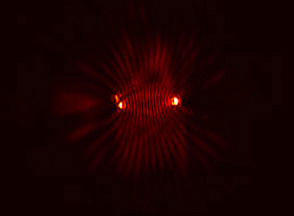 Fluorescence emitted when different parts within a single molecule is excited. The spatially resolved spectra allow the construction of images for the submolecular distribution of single vibronic modes. 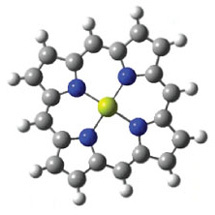 The focus of the thrust is to leverage Center strengths in optical and scanning probe techniques to address single molecule chemistry at the nanoscale. CaSTL researchers have successfully built a system that is capable of simultaneously recording the time-resolved coherent anti-Stokes Raman scattering (CARS) response and the stimulated emission signal from single carbon nanotubes and nanowires (left image). Additionally, researchers are combining infrared excitation and visible laser light to probe the vibrational dynamics/kinetics of molecules tethered to nanocrescents (left image) through time-resolved sum-frequency generation (SFG). Plasmonics, the collective electron response to applied fields, plays a central role in nearly all of the considered applications. Yet the interactions between col lective electron states and localized molecular electronic states in the presence of radiation fields is poorly understood. The focus of this thrust is to develop the common science systematically. 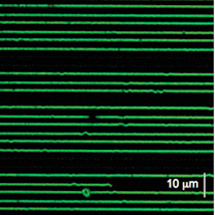 CaSTL has a range of projects in this thrust from demonstrating background-free four-wave mixing excitation of surface bound targets by surface plasmon waves (left image); combining AFM/Raman studies of plasmonic molecules; measuring, for the first time, surface enhanced-femtosecond stimulated Raman spectra of bipyridine molecules bound to gold nanoparticles; and custom fabrication of plasmonic nanostructured materials by optical trapping methods. The Theory thrust provides state-of-the-art knowledge, facilities, and training to perform electronic structure calculations. This entails strong interactions between theoretical and experimental efforts of the Center. Projects include understanding the role of substrates on the plasmonic response of nanoparticle arrays and understanding the mechanism of light emission from a single molecule in a nanoscale cavity. 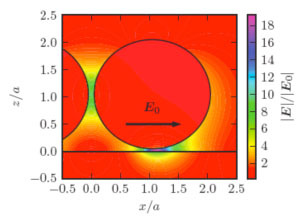 For the plasmonic response of the nanoparticle arrays, when a dielectric nanosphere is placed on a plasmon active metal substrate, plasmons localize under the particle form "hot spots" (left image). 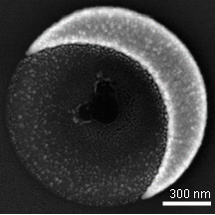 The same is true for metal nanospheres on dielectric substrates. In multi-particle clusters, the "hot spot" moves from one contact point to another as one scans through the plasmon resonance.